Buddha Jayanthi also known as Buddha Purnima is an auspicious day for Buddhists in the world as it is when they celebrate Lord Buddha's birth. This day falls on a full moon night in the month of Vaishaka, which usually falls during the months of April or May. It is believed that it is on this day that Lord Buddha left this world. 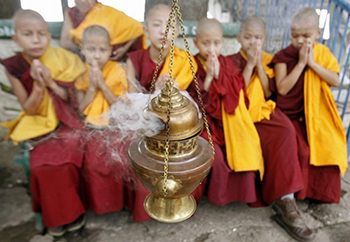 The festival celebrates the different stages of Buddha's life. The importance of Buddha Jayanthi is the birth of Lord Buddha on this auspicious day. People in India and all over the world tribute this day to Buddha and celebrates the birth of this great personality. Other than the celebration and festival, this day reminds us of the teachings in Buddha's life. Pilgrims from all over the world unite at Bodh Gaya to celebrate Buddha Jayanthi. The temples in the name of Buddha are decorated in a very festive look with flags and flowers. 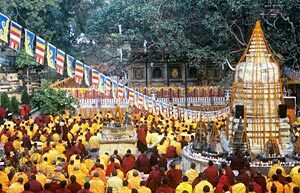 Celebrations for the day include prayers, recitals on the life of Gautam Buddha, meditations, continuous chanting of Buddhist scriptures, processions and worship of the idol of Buddha. On this fine day the streets and the monasteries are decorated with Buddhist flags with teachings of Buddha inscribed on them. In every house, the five colored Buddhist flag is hoisted. Buddha's picture is beautifully decorated with flowers in all households. For the big procession on this day, Buddha's idol is taken on a well-decorated elephant all through the city pavements. The main dish of the day is kheer and rice pudding. On this day plenty of sweets and fruits are distributed among friends, family and the poor. The spirit of sharing food among the needy is spread among everyone as this was one of the most important teachings of Lord Buddha. You can use online invitation cards from Yoovite.Com to invite your friends for Buddha Jayanthi celebrations now.